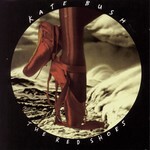 Reissue of the seventh album by Kate Bush, originally released by EMI Records in November 1993. The album was written, composed and produced by Kate. The album was inspired by the 1948 film of the same name by Michael Powell and Emeric Pressburger. The film in turn was inspired by the fairy tale of the same name by Hans Christian Andersen. It concerns a dancer, possessed by her art, who cannot take off the eponymous shoes and find peace. Bush had suggested she would tour for the album and deliberately aimed for a "live band" feel, with less of the studio trickery that had typified her last three albums (which would be difficult to recreate on stage). However, the tour never happened in the end. A few months after the release of the album, Bush released The Line, The Cross and the Curve, a movie incorporating six tracks from the album. D2. Why Should I Love You?